Serve your yummy food on beautiful dinner sets to make a lasting impression on your guests. And not just that, dinner sets can also serve as wonderful gifts to your loved ones on special occasions. A dinner set is one of the most important household staples. It is always important to keep a stock of more than one dinner set in your house, as they are more than just a way to serve your painstakingly prepared food. Different types of dinnerware can be used to complement different cuisines you serve. Moreover, they add a certain elegance and charm to your home dining experience. Whether you are looking for dinnerware for formal parties or you just want to buy a casual set for everyday meals with the family, we’re here to explain your options and help you find the perfect set that suits your needs. 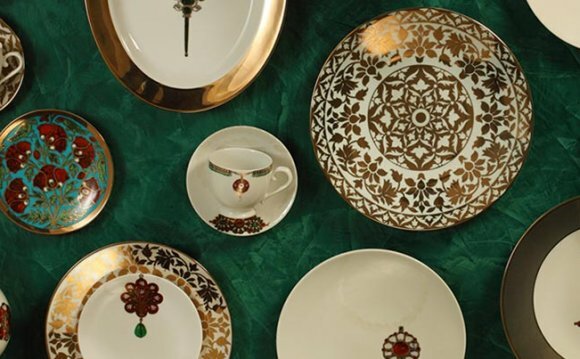 Since you might be using your dinner sets for almost every day for many years, it is important that you consider the salient factors before buying a set. Dinnerware, nowadays, are available in various designs, sizes and materials. Let’s look closely at all the aspects of buying dinnerware so you can make an informed decision. Patterns on dinnerware can be broadly classified into three types - classic, romantic and modern. Classic patterns include asymmetrical or geometrical motifs. Romantic patterns mostly comprise of animate things such as fruits, birds, flowers and so on. Modern patterns feature abstract art that add a unique charm to your dining table. You can choose from all these patterns to suit your cuisine and mood. And if you are in an experimental mood, you can always mix and match the pieces to add more fun and elegance to your dining experience. Since dinner sets are available in a number of materials nowadays, you can easily find one that suits your dining room’s decor and needs. Stainless steel - Dinner sets crafted from high-quality stainless steel are easy to maintain and can easily last for years. Since they are virtually unbreakable, they are great for houses with little kids. They also do not chip or bend easily, making them perfect for everyday use. Glass - With their beautiful texture and delicate designs, glass dinner sets are perfect for formal occasions. Available in various colors, they can infuse a sense of luxury and elegance to your dining table. Porcelain - Dinnerware made of porcelain looks graceful due to its glass-like glaze and beautiful motifs. Since it is non-porous, it does not retain the odor of food served in it. Melamine - Durable, easy to clean and available in various colors, melamine dinnerware is perfect for both casual and formal use. Love to use the microwave? Hate washing your dishes by hand? With modern amenities such as dishwashers and microwaves making a way into our kitchens, you can easily find dinner sets that are dishwasher- and microwave-safe. This is sure to make your life in the kitchen easy. From La Opala and Corelle to AsiaCraft and Milton, you can find dinnerware from various reputed brands online at attractive prices. Paying for your favourite products is also safe and easy, thanks to the various payment methods.